Have fun searching their collection! Visit Kat Soto's website for more information about her work. How long have you been making dolls? 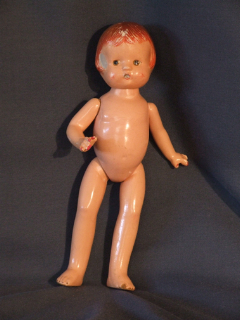 I've been making dolls since about age 5 and they were real lookers then. 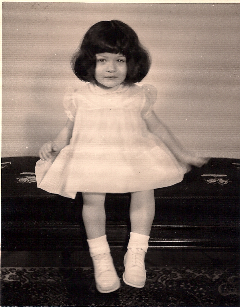 My first concoction was a brown lunch bag with a face drawn on the flap, stuffed knee-sox tied on for arms and a second pair of stuffed knee-sox wearing my baby sisters walking shoes which were held in place under the dolls "bag" skirt by the arm tied sox. Wasn't very sturdy a playmate but we had a few adventures! I quickly moved on to rag dolls with Mom's help. My first rag type was all in one piece, made from an old flannel nightgown, had yarn hair and was named Mertyl. Mom had taught me the joy of the chain stitch and soon I was chain-stitching every scrap of fabric in sight....pin cushions, dolls, pillows. I stuffed everything with TP. Oh dear! Did you make another kind of art first? My first "art" was ceramic sculptures which we learned in the first grade. I had always liked it. In high school I did several ceramic pieces and began to sell them. Doll-making was for myself and for my younger sisters until I was 20 years old when I delved back into them as an art form. They were no longer play things but I continued to build them as such with joints, hinges and ball-joints. I also made puppets. I just really loved anything articulated and dynamic. I had begun to collect old dolls and take them apart and repair them. I was fascinated by the old ball jointing, leather bodies with gussets and complicated molded- face rag type. How long have you been selling them? Sold my first doll when I was 21 and then licensed the characters to a company called Willitts Designs when I was 24, so that would be...ooh Nelly 27 years ago! How did you begin selling your work? I made up my resin dolls and began to take them around to toy stores in our area. I took them on vacations..everywhere and was always pleasantly surprised at the reception. I didn't charge much. They were all under $75.00 dollars and I sold everything I made. 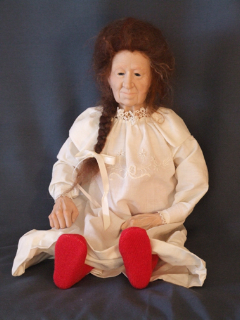 What was the first doll you made with the intention to sell like? Well I had always attended doll shows with my Mum and it's something we both loved very much. As far back as I can remember I wanted to be behind a table selling my dolls. Must be the merchant gene in me. I always wanted to be employed independently. I came from that an it seemed normal. Working for someone else seemed foreign. What prompted you to make that doll? I had a hankering to test out a new material..resin. No one was doing it and I got the idea from a can of Bondo in my Father's garage. 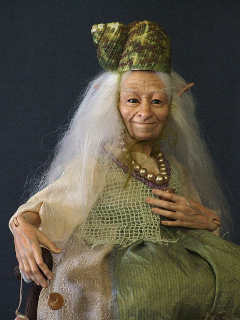 I had made dolls up to that time with all sorts of play dough's, wood paste, plaster, air dry clay, polyform clay..I wanted something I could make replicas of which kept all the detail of the plasticine originals. I didn't have a kiln at the time and so porcelain was out. I adored old people's faces and with so many undercuts, plaster molds were going to be in too many pieces. I discovered RTV molding at one of my first contracting jobs for an engineering group out of Lucasfilm. 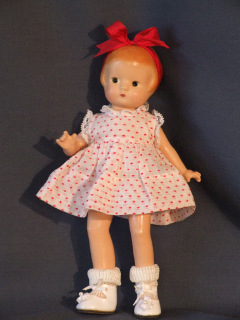 I wanted to license a line of dolls rather than do all the work myself so that the licensed goods could promote my name and i could have time to make OOAK's at a more rested pace. I had my son at age 23 and also wanted to buy a house. The licensed work allowed me to do that. How does inspiration work for you? I am an observant person. Always have been. As a child I was very shy and was better at reading people than conversing with them. I was also extremely busy! Mom could never keep me in my seat so I guess it's my nature to stockpile a bunch of images and concepts, link it up with a feeling or opinion and articulate what I see in 3D. I know I made a lot of things "for" other people so they would, in my mind, be happy. More inspiration? 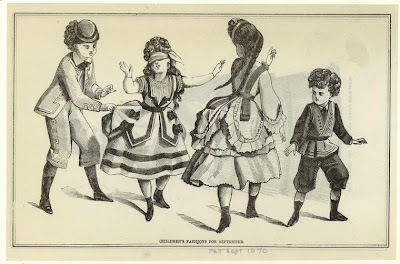 Sketches, seeing an antique doll that inspires, movies, people? All of the above but more literature than movies unless it's a documentary because by the time a character gets to the silver screen it has passed through so much editing and so many influences that it's sort of "done". Describe your creative process - do you make detailed plans before you create the doll or do you just dive in without a plan? 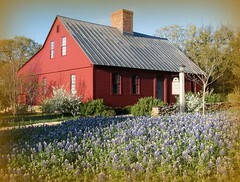 If you begin with a plan, what do you use for inspiration - antique photos, your own sketches, etc? I keep collages. Fragments of notes, scraps of fabric, photographs etc till something is born. Does the doll end up looking exactly as you planned or does it change and develop during the process? I think a doll always turns out just a bit different than the original plan. Even with Limited Editions when I have created the same doll 3 or 4 times. I learn a lot as I go, change my mind or something unexpected comes to light. What is your favorite creation that you've made? Cinderella because she was made with hardly any supplies and she turned out the way I had imagined she would. I knew every detail in my head. What gets in the way of creating for you? 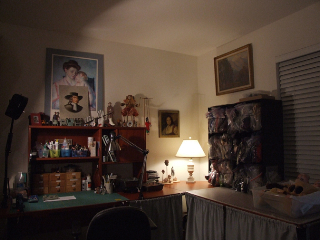 What keeps you engaged in the doll creating process? The excitement of seeing how a doll will turn out or the challenge of creating a reproduction to see how it used to be done. When you make an artwork, do you have in mind the receiver of the work (i.e. collector) or do you ignore that someone down the road will be buying your work? If it is personal, always. If it is an expression of my outlook on life I will always endeavor to challenge myself to create with many listeners in mind and see how many will "get the message" I suppose it's the same as pleasant conversation where the speaker actually cares that the listener understands and can gain insight or inspiration from what is being shared. "Shared" being the operative word. Some pieces I make just for myself because I want to have the character around. For therapy however I always write. I would never bother to take anger, angst or frustration to 3D...because I believe in release for mental health and letters you can shred, burn, tear-up in a flood of tears..... I don't want to shred or be reminded of pain or ugly fleeting thoughts with my art. Does this influence a piece of work for you? Thinking selfishly for the perceiver does alter the work. It is a discipline and joy like preparing a delicious meal which you hope the diners will enjoy and the challenge is you are entertaining a vegetarian, a meat eater and someone with allergies! Share some of your creations do you hope someone will find in a trunk 150 years from now. This is my Nana. I made her for Mum when I was 24, the year she passed and I was feeling so sad about it. These are the grouses. Domesticated grouches. I made them and gave them to my parents on one of their anniversaries in my early 20's. They are also Sculpey type clay. It was a joke about their grumblings when they would crab at each other. 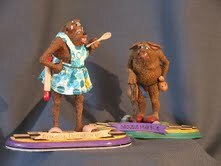 The wife Grouse has pink rollers in her ears, something I often did in high school on my sculptures. I created these creatures called city rats and always had the Mother one's in foam rollers. I was the jokie-smurf kid. This is Nana and Gramps. They were true pioneers and hardworking European stock. She, Helayne Mary Volquardsen was Danish and he, Gustav Emille Rahm was Swedish. They were ranchers and he was a celebrated officer in the US Navy. He was a Captain when he retired. He was stern but loved a really good joke or prank. She was everything and I mean everything a Nana should be to a granddaughter. 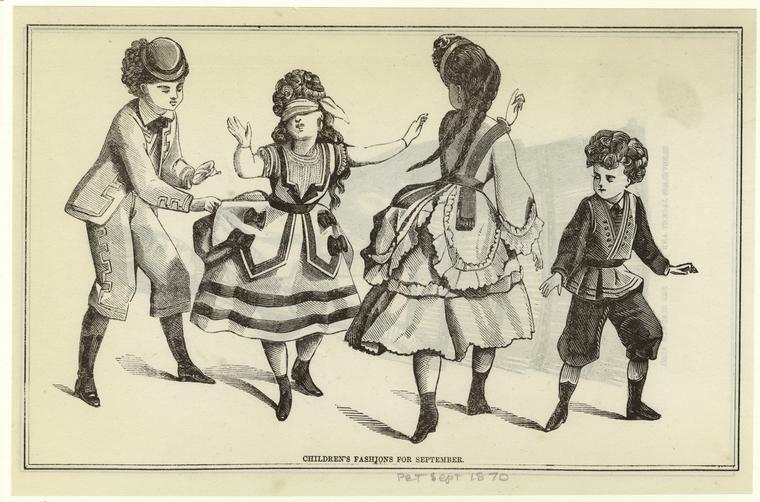 She was as proficient at herding up a round of cattle as she was being the bell of the ball at the officers club. Great cook and very loving till the very end even through bad days with her diabetes when she would say to me "Honey, I feel like the last rose of summer". Her favorite game was Yahtzee and she had the special leather bound dice cup. Sunday nights at her dining room table you could here her yell "Lookie lookie here comes cookie" or "Baby needs a new pair of shoes!" When she went blind and I rolled for her and if I got a low score she would lament "couldn't we do better than that?" I soon fibbed about the rolls. She loved it. 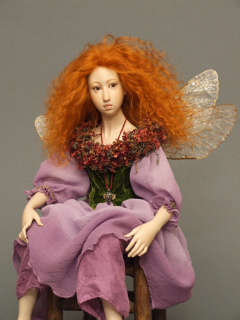 How has your work changed since you began doll making? Technique has improved, better materials are available, exploring new subject matter is fun. 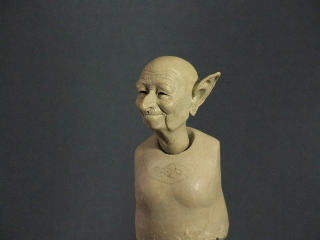 I pretty much stick to my genre of sculpting which is Classic Renaissance but I like to play with trends. Trends are like a contemporary conversation and everyone has their two cents to share. They will probably get very odd looking as I get old and crumpled and my sight fades. I imagine I will be sculpting until the day I die. 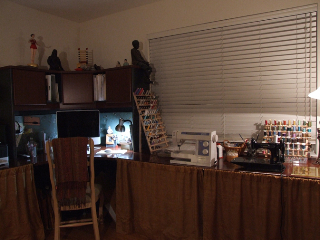 I have a studio at home and one at the Gallery in San Anselmo. Yes. "Lunch-sack Sue" as my mother called her was my first then more sophisticated rag types as I learned how then sculpted dolls. 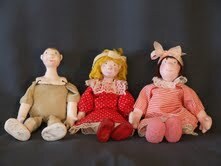 These were my first real dolls. I made them between ages 8 and 10. The one to the right was made from a boiled up local newspaper and flour. The middle one was with a new type of clay called Fimo, now Sculpey. It was fun but I almost always got the cooking time wrong and burnt it. The doll on the left was the latest one at age 10. At 11 I discovered tennis, track and boys. No dolls for a long while but did create a lot of ceramic sculpture in high school. I became interested in sewing and was making my own swim suits and skirts by 16. Wrap skirts were all the rage on the tennis court and I made atl east 20 of 'em. I married at 21 after art school, and had my boy at 23 and got back into the dolls. This time resin was my passion. 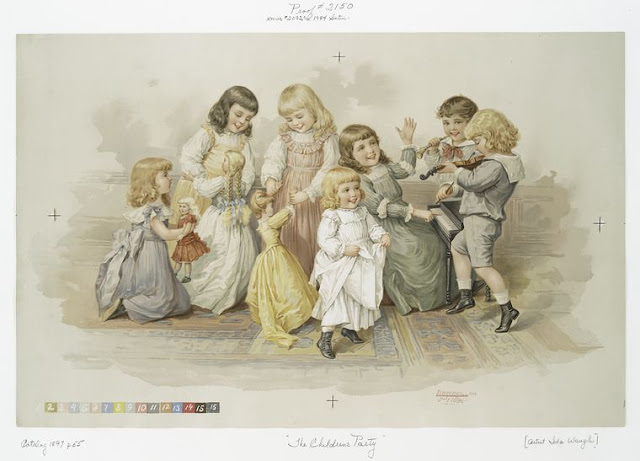 What was your favorite doll as a child? 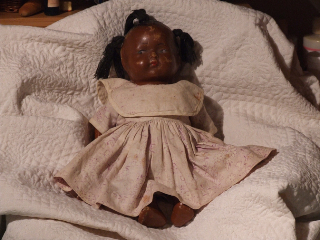 My mothers dime-store black doll named Violet and a tiny Effanbee named Star. What were your other play interests as a child? Forts, keeping up with neighborhood boys because they got into more interesting stuff than the girls, and hours and hours of play outside where my dolls had ponds and lakes and tree houses and tea with toads and salamanders. Building things. Concocting new goop to sculpt with. Name three doll makers (living or not) who inspire you. 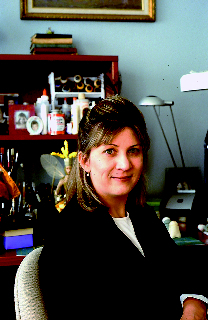 Kathe Kruse because she was clever and enterprising, used that beautiful Fiamingo bust in such a perfect way and her dolls were so charming. George Stewart because he is meticulous. Martha Armstrong Hand because she was to the point and a great great engineer and modelmaker. 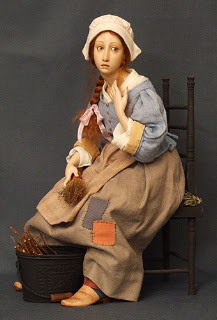 What is your favorite type of antique doll and why? I like the old creche mannequins because they were not only beautiful but could articulate. I love wax dummies for their nostalgically creepy realistic beauty. I love folk rag dolls for their old country hard-wearing charm and well worn skin. I love carved wooden dolls like the Queen Ann's and Higgs style dolls because they are wonderful characters. 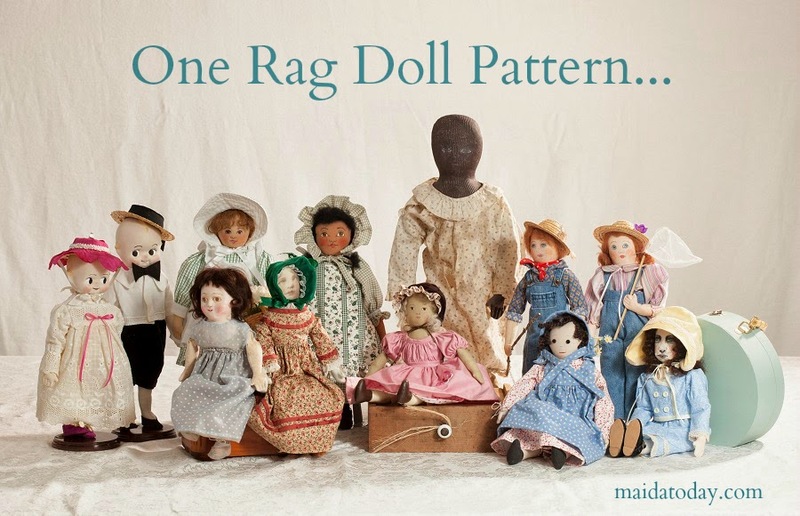 Please share about any antique dolls you own and why you own them. 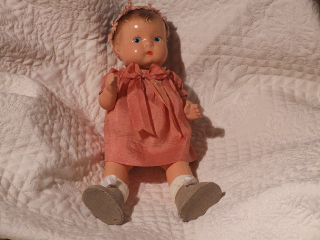 My Mother's "Little Violet" Her favorite doll and mine too. They're not 100 years old yet so I think they fall under the nomenclature of Vintage. They're my Mum's dolls. They are forever precious because they have so much of her in them. If I called them Antiques Mom would give me the "eye" so we'll just say "Vintage". Little Star, also one of Mom's. What are your present hobbies? Do you have a doll making technique/tip you'd like to share? Well, as much as artists will swear that they never use press molds, it is singularly the most requested lesson I offer...that and ball jointing. The easiest press mold to make is silicone putty. The cheapest is plaster. The most effective is silicone lined plaster. It's good for BJD body parts as well as simple masks for rag dolls. Is there anything you'd like to share about your creations that we haven't covered? Well, just that I believe by my word and actions that anyone wanting to articulate themselves in 3D can do it. It doesn't cost too much but it will take a lot of determination and elbow grease. Earn your stripes 'cause they're no giving them away and be generous in your message. Keep up with modern themes and materials, keep it safe and respectful of the planet and your health. Have fun! Showmanship counts but don't make the costume or persona greater than the artwork...it's transparent. "You are not a human being in search of a spiritual experience. Tell us one quirky thing about you. I've been tidy all my life. My mother said disarray bothered me even as an infant. 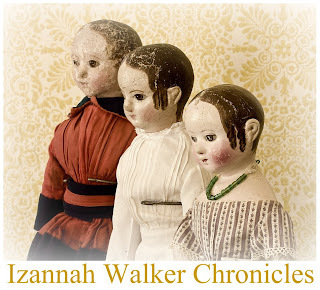 What question would you ask another doll maker that you have not been asked? Kat's question: Does your craft bring you joy and if it does is it reflected in the art? Kat's answer: I hope it shines through because I honestly made the effort. Visit Kat's website for more information about her work.